Kings XI Punjab164-4 (Shaun Marsh 68, Nitin Saini 30, Kieron Pollard 2-14) beat Mumbai Indians 163-6 (James Franklin 79, Dinesh Karthik 35, Parvinder Awana 2-23) by 6 wickets. Mumbai Indians scored a reasonable total of 163 runs with four wickets in hand and Kings XI Punjab achieved the target by hammering 164 runs after losing four wickets with three deliveries to spare. 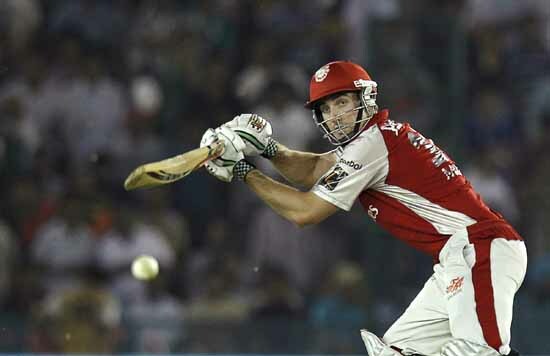 Shaun Marsh (Kings XI Punjab) was declared ‘Player of the match’ for his superlative unbeaten innings of 68 from just 40 balls. The 28th match of the Indian Premier League was played on Sunday, April 22, 2012 at the home of Mumbai Indians, Wankhede Stadium, Mumbai. The stadium was filled with the holiday crowd who supported their team from the first ball bowled until the close of the encounter but were deprived with the triumph in the end. Earlier, the captain of the local team, Harbhajan Singh won the toss and preferred to bat first on the shaved pitch which looked full of runs. James Franklin and the little master, Sachin Tendulkar opened the innings in vigilant manner and the first three overs produced just 11 runs. Franklin started up with a couple of boundaries in the fourth over and Tendulkar followed him in the sixth over with the same result. The latter was dropped for 20 runs on the second ball of the eighth over by Parvinder Awana at short fine leg off Azhar Mahmood. Tendulkar was unable to manipulate the opportunity and was run out on the first ball of the next over for 23 runs as the total crept to 51. The promising Rohit Sharma did not last longer and became the second victim five runs later for just two runs. Dinesh Karthik came in next and tried to stabilize the innings with Franklin. 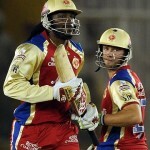 They secured 19 runs in the 12th over aided with a couple of well timed sixes by Franklin and a four from Karthik. The latter continued with the aggression and sent the ball twice reeling out of the ropes in the 13th and 14th over consecutively. Franklin scored his fifty in the 13th over and punished Praveen Kumar for 17 runs in the 15th over with two grand sixes and a four. The duo contributed 75 speedy runs in just 36 deliveries when Karthik was runs out for 35 runs scored off 20 balls with 5 fours. The third wicket fell at 131 runs and Franklin was the fifth batsman who went back to the pavilion for 79 off 51 balls with 4 huge sixes and 6 fours. 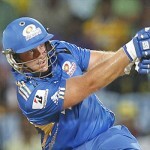 Mumbai Indians smashed 163 runs for the loss of six wickets in the allocated 20 overs. Praveen Kumar and Parvinder Awana were the only successful bowlers with two wickets each. Nitin Saini and Mandeep Singh started the chase with a couple of fours from the latter in the first over bowled by Munaf Patel. Saini joined him in the third over as once again Patel suffered for two fours and the batsman continued with the attack. He was declared leg before wicket off Pragyan Ojha on the second ball of the seventh over for 30 off 25 balls with 5 fours. The first wicket associated 48 runs and 13 runs later Mandeep Singh was caught at deep midwicket by Franklin off Kieron Pollard for 24 off 21 with 3 fours. Shaun Marsh and David Hussey took over the responsibility and they initiated by accumulating 14 runs from the 10th over with the help of three fours. The score board was kept moving at reasonable pace and the first hundred of the innings was attained in the 14th over. The duo added 58 runs in 6.2 overs as David Hussey was caught by Ambati Rayudu off Pollard for 21 when 45 runs were required off 28 balls. Marsh carried on marching towards the target and completed his fifty on the last ball of the 17th over with a four as 20 runs were required to win the match from 12 balls with six wickets in hand. David Miller was at the other end as they gathered 11 runs in the 19th over off Munaf Patel with a six on the fifth ball from the willow of Shaun Marsh. The equation came to 9 runs from the last six balls off Thisara Perera and Marsh welcomed him with an almost one handed six over deep point. He took a single on the next ball and Miller got the winning couple towards long off as the target was achieved by thrashing 164 runs for the loss of just four wickets. Marsh remained unbeaten for 68 off 40 balls with 3 escalated sixes and 5 fours as Miller was at the other end with 5 runs. Pragyan Ojha and Kieron Pollard impressed with the bowling by getting two wickets each as other bowlers remained unimpressive. Mumbai Indians – 6 from 6 games. Kings XI Punjab – 6 from 7 games.